ReviewTrackers is in NYC for the Big Show. 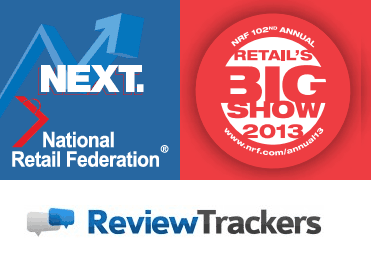 We’re reaching out to thousands of retailers from all over the world in the National Retail Federation’s 102nd Annual Convention and Expo (#NRF13), which runs from January 13 to 16 at the Jacob K. Javits Convention Center in New York City. The event, which gathers over 27,000 retail professionals and 490 exhibiting companies from over 80 countries, serves as a wide-reaching venue for exploring and sharing the latest industry solutions in retail. ReviewTrackers offers one such solution: online review monitoring for local businesses with multiple locations. “For retailers to thrive in today’s global arena, they have to constantly listen to what customers are saying – especially on review sites like Yelp, Google+ Local, and Foursquare,” says Chris Campbell, Chief Tracking Officer for ReviewTrackers, who chatted with retailers about online reviews in Sunday’s kick-off party. Retail’s Big Show 2013 is frequently ranked as one of the top 200 events in the US, as well as one of the 50 fastest-growing trade events in the world. This year, it features top CEOs and industry executives from leading retailers such as Starbucks, The Container Store, Walmart, and Whole Foods. Topics range from digital and mobile retailing to corporate social responsibility and new economic and consumer trends this 2013. A star-studded list of retailers and speakers are also gracing #NRF13, including U.N. Secretary General Kofi Annan, best-selling Socialnomics author Eric Qualman, Walmart US CEO Bill S. Simon, IBM Global Business Services retail VP Jill Puleri, Zaarly co-founder and CEO Bo Fishback, Square CFO Sarah Friar, Mango Senior Vice President of Business Development Jose Gomez, and Home Depot Foundation COO Fred Wacker.